Big meadows and crazy rock formations contrast each other in this great loop in the Mammoth Area. The trail starts near the Golden Gate south of Mammoth, and traverses through big open sagebrush meadows. Large peaks of the southern end of the Gallatin Range are visible over the hillsides. Before the trail enters the draw from which Glen Creek flows, take a right at the junction onto the Snow Pass Trail. It continues, following under power lines, past a little wetland area, then gently over Snow Pass before steeply dropping into the trees. At the bottom of the hill, the trail levels out and intersects the Howard Eaton Trail. Take a right on the Howard Eaton Trail and head up toward the Hoodoos. This trail begins in the forest, then transitions to meadows and parallels the Grand Loop Road. Views are of Mt. Everts in the distance to the north, Bunsen Peak’s rocky flanks to the south, and the cliff rimmed Terrace Mountain to the west. The Hoodoos become visible and it’s not long before you’re walking amongst these large boulders and rocks that provide great habitat for pikas. Eventually, you leave the Hoodoos and climb up the Golden Gate Canyon. 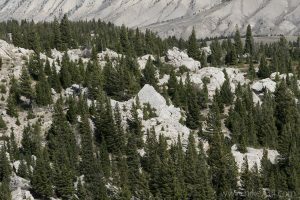 The trail traverses the hillside with great rock formations differing from the Hoodoos, as well as the great spires on Bunsen Peak. The trail eventually levels off as it rounds the corner out of the canyon, offering great views of Rustic Falls and Swan Lake Flat. From there, the trail disappears into the trees before entering the meadow and joining up with the trail that you started on.